1. The inability to concentrate. 2. The pervasive habit of looking for short-term emotional gratification. And those are the reasons why you keep failing in the markets. The problem is not technology, rather it is our indiscriminate and undisciplined use of it. This is easily observed by trying to quiet your mind. Within a few minutes, you’ll notice that you actually can’t. What’s more, the temptation to let the mind do this is incredibly overwhelming. “I’m going to sit here and read this article fully”, you might vow to yourself. But at the same time, there’s a voice in your head urging you to look at something else. After about 15 seconds of reading and struggling to stay focused, you’ll eventually jump to conclusions and move on. Most people have been doing this for so long now that they’ve become content to live with such an undisciplined mind. It’s become automatic; a second nature. Our minds have taken us millions of years to adapt to our environment, but the torrent of information available to our senses nowadays, and the new technologies that feed it to us, are new. So new that our minds haven’t evolved to deal with them appropriately. We don’t have internal rules for them yet, so we indiscriminately install time-wasting apps on our phones and focus-interrupting alerts. We jump at text messages and emails… Our minds are addicted to micro-emotional highs. And our capacity to focus? Forget about it. It’s at record lows! Don’t get me wrong, I’m not telling you that you should dump your phone in the trash can. The problem is not technology, rather it is our indiscriminate and undisciplined use of it. Checking your phone 100 times a day, not deliberately directing your attention towards one thing only, doing what you want to do instead of what you should do, multitasking… all these things when turned into habits make your mind undisciplined, weak… flabby. Your mind can’t filter out irrelevancy anymore. It becomes chronically distracted and lost in its own stories. And this makes you less productive, less happy, and definitely less capable of reaching your goals in the markets, as a trader. ✔ If you can’t focus on one strategy. ✔ If you don’t have the patience to wait for your signal. ✔ If you can’t manage to let your trade work independent of you constantly checking your PnL. ✔ If you constantly seek to tweak your trades once they’re on. ✔ If wins make you overly happy and losses depressed. …then you have a problem! The feeling of “flow” is what a well-trained mind is all about. You see, when you check your phone 100 times a day, when you can’t even give your full attention to a book or an article, you are conditioning your mind to slobber in anticipation of some mini-bursts of pleasure. You are conditioning it to be impatient, short-sighted, undisciplined, addicted, and weak. When this becomes the norm of your mind, it pours into everything that you do – and yes, even trading! Your mind becomes ingrained in a habit — a compulsion — of discursiveness and seeking short-term emotional gratification. Try to become aware of the feeling in your body at the moment. Do you want to rush the reading so that you can tend to something else? What is the precise feeling in your body? That feeling of discontinuity, the “jerkiness” of being pulled out of concentration, this is what we want to overcome. Close your eyes if you can and really try to get a sense of what that feeling is. The feeling of “flow” is what a well-trained mind is all about. This is mental strength! And you can learn to develop this state at will. Though Jobs wasn’t a trader, he knew pertinently that grand achievements require a mind training that would help reclaim one’s attention and regulate emotions. 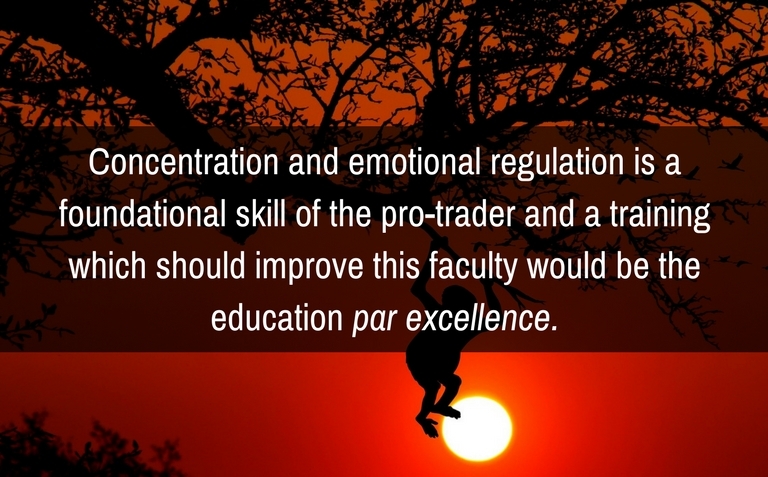 Concentration and emotional regulation IS a foundational skill of the pro-trader and a training which should improve this faculty would be the education par excellence (French for beyond comparison). And such a skill won’t just make you better at trading, or entrepreneurship. It’s a core life skill that will make you better at everything you do! It will give you an edge, a competitive advantage… It will bring you greater calm and mental clarity. The focus, poise, and confidence you’ll cultivate will create a new reality for you where incredible achievements become more tangible. Grand achievements require a mind training that would help reclaim one’s attention and regulate emotions. 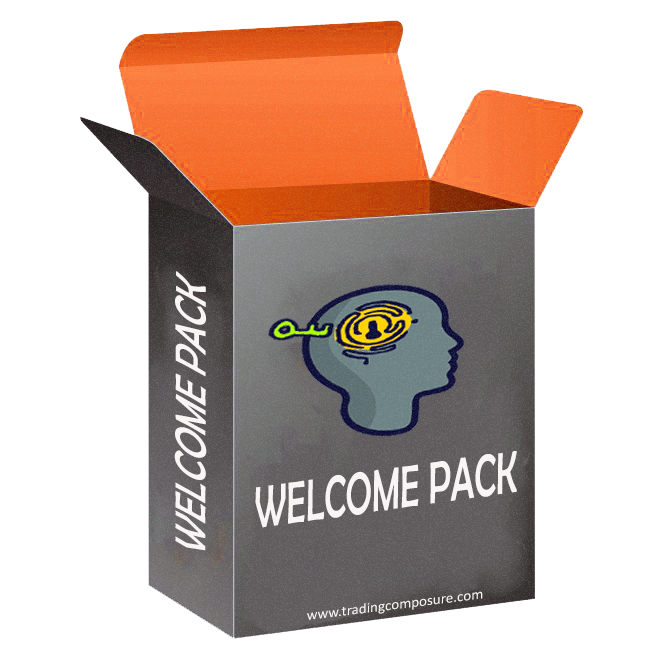 The good news is that I have created such a course and it’s called The Trading Psychology Mastery Course. 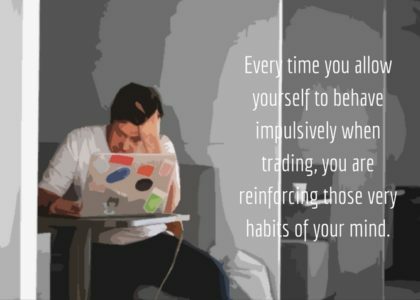 In it, I bring my unique understanding of mindfulness and trading together, and we work on dismantling some destructive habits of the mind that cause you to lose in the markets repeatedly. In there, I help you develop concentration and stillness, and you’ll gain a better understanding of yourself. With that understanding comes better clarity, patience, focus, wise discernment, and resilience – essentially, all of those wholesome qualities that a good trader must possess. I’m not going to throw rehashed things at you. No. We’re going to practice together! Simple. Because you are addicted. Our minds crave information. That’s what they eat! Unfortunately, they also have bulimia, and they need a cure. And the cure has to take the form of a mental exercise. We live in an era of information and technology, and so, you can’t shield yourself from information. Instead, you need to learn an exercise that actively increases your powers of concentration. You need such exercise so that your mind can learn to focus on one thing, and one thing only. So that it becomes a master of emotional regulation. This is how you discipline your mind. If you feel you might want some assistance from someone who actually walks the talk, then check out the offer below. Thanks Yvan. Helpful. I read it so carefully that I noticed you repeated two sentences back to back near the end. Great stuff sir! Having exactly this problem at back of my mind, but you named it and bring to the surface! Very helpful, from now on, I will tremendously focused on exactly this one thing, sure it will have great impact.